Bark For Life, round 2! ATX Social Pup > Events > Dog Friendly Bar > Doghouse Drinkery and Dog Park > Bark For Life, round 2! Canine companions demonstrate unconditional love, security, compassion, joy and no judgments of cancer survivors abilities or appearances. 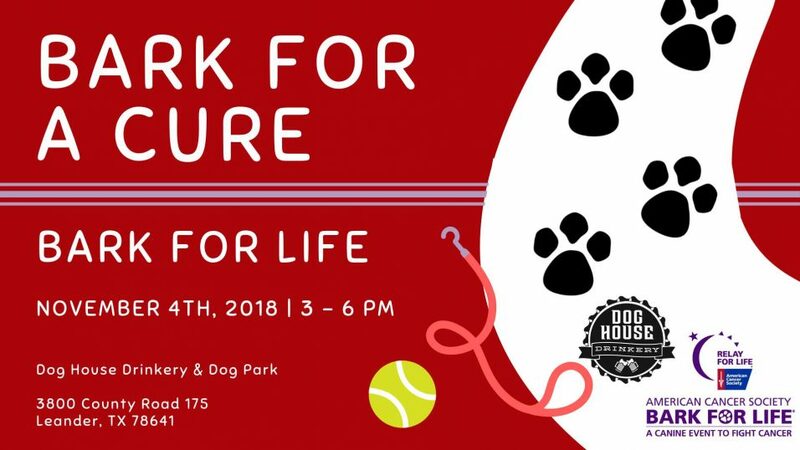 Bring your pup* and join us for a day of games and prizes, music, hot dogs on the grill, vendors, and more as we honor the life-long contributions of our canine-caregivers! *Note: dogs are allowed inside of our event space at the venue with no stipulations! However, to enter the off-leash dog park provided on site – there is a $5 entry fee, proof of vaccinations and spay/neuter must be provided, and the pup should be well socialized and able to play well with others. Interested in being a vendor? contact KShupe98@gmail.com for more information!